Learn About Our Cities Historical Architecture & Much More! During this private 90 minute trip we will see over 20 buildings signifcant to the history of Buffalo. Free ice, cups and use of cooler. Mornings........ $369.99 (8:45 AM and 10:45 AM) **plus gratuity, traditionally $6.00 a person. Weekday Afternoons....... $429.99 **plus gratuity, traditionally $6.00 a person. Haven’t you ever wondered how Buffalo earned its nickname as the City of Light? You can learn that and more when you take a turn on a historical and architectural pedal bike tour of Buffalo, NY. Get out of the office for a day and join us on an historical journey through the city. It’s our goal at Buffalo Pedal Tours to provide you with a staff outing that will not only enhance collaboration but create a lasting bond among employees! Our two most popular corporate tours include our Buffalo Historical Architecture Tour and our bar hopping excursion. Our tours offer a great opportunity to learn about your staff while also learning about the city. At Buffalo Pedal Tours, we understand that every office has a different alcohol policy, so feel free to opt for a dry ride or a “hydrated” ride. We also offer dining tours that stop at some of Buffalo’s most beloved hot spots for delicious food, perfect for a retirement party or showcasing our city to out-of-town clients and employees. Our guides will take you on one of the best history tours in Buffalo, NY where you’ll learn about the unique architecture and humble beginnings of the city’s most famous landmarks. This includes our beautiful City Hall, the Electric Tower, and the iconic Statler Hotel and Hotel Lafayette to name a few. Learn about how Buffalo became one of the first cities to host widespread electric power, and the pioneering people and technology that made it possible. Our bar and brewery tours will take you to 3 bars – which bars you visit will depend on which location you start from. The Buffalo Historical Architecture Tour is great for larger groups and multi-bike tours are available, accommodating up to 86 people. 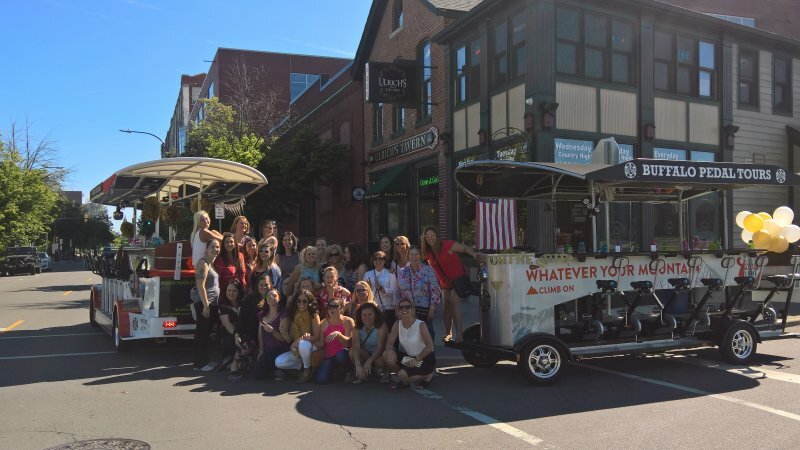 We will help you plan and organize your corporate outing to ensure that you and your fellow staff have a riveting experience exploring Buffalo together and building camaraderie. If you’re interested in booking one of our history and architecture pedal bike tours in Buffalo, NY, give us a call at 716-984-3834!